Bernhard Schwaiger has added another 8C-or-harder to his already mighty list by doing the FA of Hurricane, 8C, at Birgkar, Austria. 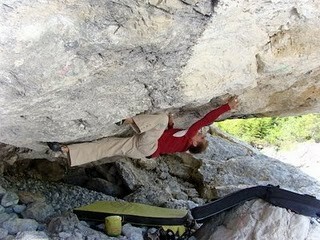 Extreme body tension is required to be able to link the 10 moves on tiny holds in steep terrain. Even though this style is where Berni excels, he could barely establish himself anywhere on the problem when he first tried it last fall. "Well, I guess I need to get stronger than", was the obvious conclusion. Then it all came together on a perfect day. Although it was 25 degrees in the valley, the air was crisp and there was a perfect cool breeze at 1400 m where the boulder is. About the difficulty, Berni says: "It could be 8C, or even harder or a lot easier, it's not that important, time will tell." Full story, in German, on Schwaigerbrothers. Photos: Bernhard Schwaiger collection. More photos on Schwaigerbrothers.